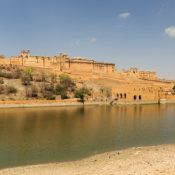 View of Amer Fort near Jaipur, in India's Rajasthan State. 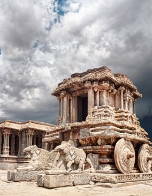 A stone chariot at the Vittala temple complex at Hampi in India's Karnataka State. A builder on a site in Sarojini Nagar market, New Delhi. India became the Commonwealth's first Republic on 26 January 1950. The longest-standing of India's three national holidays, marking the end of the British Raj.